Citizens of 38 countries can travel to the United States for tourism or business for up to 90 days without a visa under the U.S. Visa Waiver Program. A tightening of requirements in 2016, though, prevented those citizens from using the online VWP if they visited Iran, Iraq, Libya, Somalia, Sudan, Syria or Yemen after March 1, 2011. U.S. embassy sources in Madrid told El Pais the system automatically rejects applications from people who traveled to those seven countries. The travelers could enter the United States by obtaining a visa, a more time-consuming process, the U.S. embassy sources added. Solana told El Pais he will complete the paperwork to obtain a visa. Solana last traveled to Iran in 2013 for the inauguration of Iranian President Hassan Rouhani, who is part of the country’s reformist political sector and a former negotiator in the nuclear deal. By then, he had no official government office. 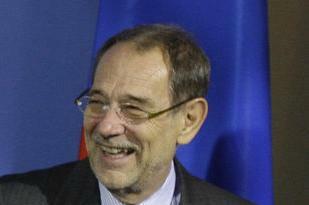 Solana was one of the first people to promote the Iran nuclear deal as the European Unions diplomacy head. Trump rejected the Iran nuclear deal approved under former President Barack Obama in 2015 last month.